Trying to lose weight can be difficult as most healthy recipes require you to know specific and unusual skills for cooking a variety of unusual grains or unheard-of vegetables. Not only can it be taxing, it is often time-consuming trying to piece together a healthy diet that you can stick to which is both delicious and realistic. Why not try one of these quick and easy 3 ingredient recipes to tickle your tastebuds and cut down the belly fat. Rich in iron, zinc, vitamins B12 and B6, and niacin, salmon also contains omega-3, which is great for reducing the risk of heart disease, while also being high in protein. Honey-mustard glazed salmon has around as little as 280 calories a serving as is so easy to make. Per serving, put a tablespoon of Dijon mustard, a tablespoon of raw honey, and a tablespoon of olive oil (the oil doesn’t count as an ingredient!) into a mason jar. Place the lid on and shake vigorously. Add a little salt and pepper to taste. Place the salmon fillet on a foil-lined baking tray and pour the mixture generously over the top. Bake the salmon in the oven at 400 degrees for 8-10 minutes. This dish is delicious served with a light spinach salad drizzled with lemon juice. High in 4 incredible antioxidants (riboflavin, copper, selenium, and potassium), Portobello mushrooms are a nutritional wonder. 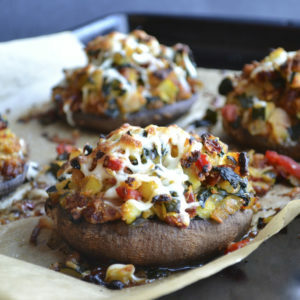 Their meaty texture makes them surprisingly filling, despite being only 25 calories a mushroom. Smother the mushroom in olive oil and sprinkle smoked paprika on the inside. Grill this for 2 minutes and then crack and egg into the mushroom, giving the meal a nice addition of protein. Sprinkle the egg with more smoked paprika and bake in the oven for 8-10 minutes. These mushrooms can be served with brown rice or on a bed of arugula with balsamic dressing. A nice winter warmer, this salad has a fresh twist of autumnal flavors. Fennel is amazing for keeping your heart healthy due to the fiber, potassium, vitamin C, vitamin B6, folate and phytonutrient content. Line a baking tray with baking paper and pre-heat the oven to 400 degrees. 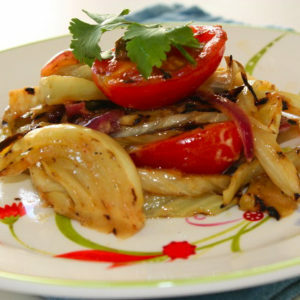 To serve 4, slice 1 large fennel, 2 large oranges, and 2 large onions. Toss these vegetables into the baking tray with 2 tablespoons of olive oil and sprinkle with salt and pepper. Roast these vegetables for 15 minutes, turning occasionally. Serve with a little lime juice and a sprinkle of hot curry powder for a little extra kick. Quick, healthy cooking shouldn’t be difficult. Combined with weight loss supplements such as Flat Belly, you’ll be dropping the pounds in no time and feeling like a brand new person. Just remember, if you want to add a little extra carbohydrate to these recipes, try to stick to whole grains such as brown rice or whole-wheat pasta to ensure you are getting the fiber-dense bran and nutrient-rich germ that keeps you fuller for longer.